If you haven't read Part 1 yet, check it out HERE! I woke up about 12:15 am feeling kind of crampy. It really just felt like I needed to poop, so I headed to the bathroom. I went a little bit and then headed back to bed. Then, around 1:15 am, I woke up to the same kind of pain (but stronger) and me holding my lower stomach and groaning. The fact that I woke up holding my stomach and groaning made me think (for the first time) that maybe this was a whole lot more serious than me needing to poop. I headed to the bathroom anyway to see if that would help. I did use the restroom, but it didn't help at all, and I had two more contractions while I was in there. I got up to walk around a little bit and called Mrs. Becky. While I was talking to her, the contractions never stopped, so I told her she might need to go ahead and start driving to our house. Of course it was POURING outside because of the Tropical Storm. After I got off the phone with her, I went and got Matt out of LL's room and told him to come into ours. When he got in there, I told him I thought I was in labor and that he probably needed to go ahead and get in the shower. We both got showered, packed a few last minute things, and got ready to head to the hospital. My contractions were lasting anywhere from 30 seconds to a minute and were anywhere from 2 - 7 minutes apart. Mrs. Becky got there about 2:00 and we were on the road to the hospital by 2:15. When we left the house, it was POURING. Not just raining, but POURING. 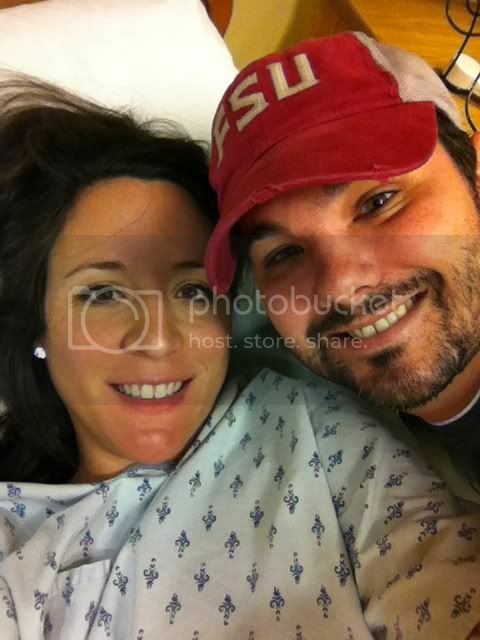 We got to the hospital by 2:30 and I had had 3 or 4 contractions on the drive. We had to stand in the parking lot for a second for me to finish a contraction, and we also had to stop two times on the way in for me to have contractions. Luckily, the rain had stopped so we didn't have to stand outside in the rain to do all of this. We walked in the ER entrance and they could tell without us even saying anything that I was in labor and got me a wheelchair pretty quickly. By this point, I couldn't talk through my contractions at all and had to just focus on breathing through them. When the receptionist looked at Matt, he just pointed at me and said "labor" - haha. They got me a wheelchair pretty quickly. When the guy started pushing me to the check-in desk, he said, "You have seen a doctor, right?" I said yes and he said, "Good. Because you look just like a girl who came in here earlier in labor. She hadn't seen a doctor her entire pregnancy, and before we could send her to labor and delivery, we had to send her to the ER to confirm her pregnancy." And she was in LABOR! Crazy! It took about 10ish minutes (and a few painful contractions) to check-in (the perks of the middle of the night, I guess), but then we had to wait for FOREVER for transport to come and take me up to L&D. By this point, I was not able to talk through contractions AT ALL and had to just focus all of my energy on breathing. When we got to L&D, they took my weight (I had gained some major water weight and my last weigh in put me at about +26 lbs), and then put me in this tiny room for monitoring. Why in the heck do you have to put me in there when I am obviously in labor? I knew it was because they needed to make sure that I was in active labor (and not sending me home), but it was super annoying! The girl checked me in there pretty quickly and said that I was at 5 cm, about 80% effaced, and -2 station. She realized pretty quickly that I wasn't going home and started asking me her millions of questions and getting me ready for my L&D room. While we were in there, my contractions got so bad that I actually couldn't stay quiet during them anymore. I wasn't super loud or anything, but I was definitely having to groan through them. Super embarassing. While we were in that little room, she asked me if I wanted an epidural. I had signed the forms, but I really wanted to see how long I could make it and *try* to make it without anything. I told her this, but after about 15 more minutes of contractions, I knew I wouldn't be able to do it. I just really felt like it wasn't going to be possible for me. I told her that Marie said that she would come in for me when I went into labor and asked her if she could call her. She said that because Marie didn't write on my sheet, she couldn't do that. I was REALLY bummed about this - especially because I KNEW that Marie would do it and that she was in town. Then, she said that Teresa was on call. We go to church with her, so I felt like this was a good back-up. Then, she came in later and said that Dr. Moseley was already at the hospital, so he would be the one to do it. By this point, I just thought "screw it" and decided to not let it get me upset. FINALLY they got me moved to my own room. I was in some major pain at this point and, during every contraction, I was mega moaning through them and wiggling all over. I knew that I needed to really try and stay relaxed through them because if I was tense, my body couldn't do what it needed to. Even though I knew that was the goal, I totally couldn't do it. The first thing they had to do was give me my IV. This was a super hard task because I was contracting so often, and during my contraction, it was almost impossible to stay still. She tried the normal vein near my wrist first. She could get it started, but the she couldn't push it in far enough. And trust me, she pushed HARD to try and get it in there. Not my favorite part of the morning. Finally she got it in right above the crook of my elbow. Before they could give me the epidural, they had to send some of my blood off to check the platlate level, and then they could call the anastesiologist. Basically, all of this took forever. By this time, my contractions were mega intense and coming one on top of each other. Honestly, I don't know if they ever went away at this point. When the peak of the contraction would go down, I still felt a constant level of pain. My nurse (Kirbi) checked me again right before she called the anastesiologist, and I was at a 6. At this point, they really just left me alone a ton while we waited both for me to progress and for my epidural. Compared to my labor with LL, I did NOT handle these contractions very well. The only position I felt like laying in was on my back, and during the contraction I would moan and groan (it sounded SO loud in my head and I was completely embrassed about it, but I simply didn't have a choice), and kind of rock my body back and forth. Kirbi came in somewhere in these horrible contractions and said that Marie just *happened* to call up to the hospital (at 4:30 am?!) and Kirbi told her I was up there and Marie said she would come in for me. Score!! Finally, at 5:00 am, the anastesiologist got there. He was old, grumpy, and took FOREVER. The good part was that he was definitely awesome at what he does. Once he got it done, I started feeling better almost immediately. I could still feel pressure, but the pain went away completely within 15 minutes. Just like with LL, I could still feel my legs and move them, it just felt numb (like when you go to the dentist). A pretty perfect outcome if you could ask for one. This is also when Matt finally called all of our parents and texted people to tell them we were at the hospital and that I was in labor. We really didn't want anyone up there waiting, so there was no need to call everyone in the middle of the night. At one point, Cooper's heart rate dropped a little bit (not in the scary range, but not where they like it), so Kirbi had me lay on my right side and gave me an oxygen mask. I only had to wear it for about 15 minutes before everything stabilized. I was more willing to smile for a picture after my epidural. Before was just impossible. :) We're ready to meet our little guy! At about 6:00, Kirbi checked me and said that I was all the way dilated but had a little lip of the cervix left and she wanted me to continue to lay on my side to get it to go away. She also said Marie would be there at 7:00 and would break my water. Even though I was already fully dilated, I had no urge to push (You can still have one, even with an epidural. It's just not as common). When she talked to Marie on the phone, Marie said she wanted me to "labor down" for as long as possible. Basically, this meant that I was fully ready to go, but it would give the contractions a chance to move Cooper further down in the birth canal. If you remember, one of the concerns was that Cooper would never really move down, showing us that he (and my body) really kind of knew that he wouldn't fit. About 6:30ish, I felt a pretty big gush. I told Matt that I thought my water broke. Either that, or I peed on myself, but I didn't think that was likely since I had a catheter. Kirbi came in to check and said yes, my water had broken. Marie got there just a little bit later and checked me and said I was ready to go. I told her I was SO happy to see her and she said she woke up because the phone wrang and she thought she saw the hospital number. She said my name and face popped into her head, so she called up there and that's when they told her I was there. I don't know how or why it happened, but I'm SO glad that it did!! She said she wanted me to push one time just to see how I was doing. I did 2 pushes (well, 2 sets of 3) and then she took off the end of the bed. I knew then that this was probably going to go fast!! She got the stirrups out and I pushed 3 more times (3 sets of 3). She told me at this time that she wanted to cut me because she wanted to give him every opportunity to get out without getting stuck. I got pretty nervous and asked her if it was going to hurt (a dumb question when you have an epidural), and she said she was already done - haha. After that, she went and changed into her scrubs. I pushed 2 more times (2 sets of 3) and his head came out. I remember thinking that this was good, but being REALLY scared about the next part: his shoulders. This was the part that I was concerned about from the beginning. I pushed one more good time and he came completely out - no problem!! This was at 7:20 am. I started pushing at 7:05 am! I only pushed for 15 minutes! She pulled him out and held him up and Matt and I immediately started crying. He looked so perfect and so BIG! One of the first things that Matt said was, "He looks just like papaw!" (his grandfather on his dad's side). They put him on my stomach and I immediately started rubbing him - I was completely unconcerned with the junk that was covering him. Matt got to cut his cord and then they took him over to the baby bed to check him out. Matt went with him while Marie started to stitch me up. While he was over there, I kept asking Matt if he was okay because he wasn't crying at all! I saw the nurse thumping on his foot trying to get him to cry. He finally did and they told me he was fine. While she was stitching me up, Marie kept talking about how perfect this all went for me. She even said at one point, "Your body was SO ready to do this - your placenta is coming out and I'm not even ready for it yet!". For some people, you have to actually push your placenta out like you do the baby. For me (both times), Marie has always let it sit while she stitched me up and I haven't had to push it out at all. I asked her if it looked okay (remember they said it was aging?) and she said that it looked pretty bad. She held it up for me to see (I didn't really want to), and jokingly asked if I wanted to take it home. She said she had three people this week ask to take theirs! She also said that she would have to send mine off because of Cooper's cysts. Even though they're gone, they still look at the placentas of all of the babies that have had them?? Finally they brought Cooper over to me and I immediately wanted to nurse him. 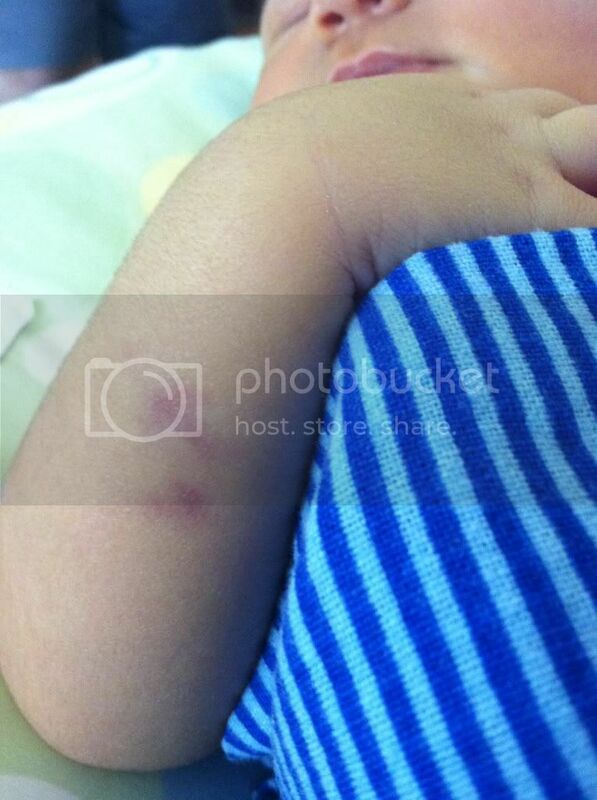 He latched on great and nursed on and off for almost an hour! The baby nurse finally came in to give us all of his stats: He got a 9/9 on his apgar score. 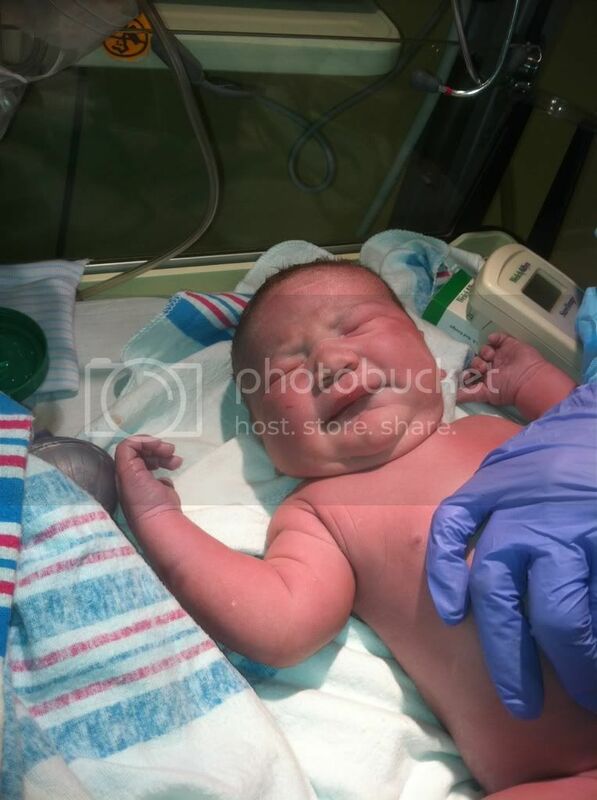 He was 9 lbs 5 oz, 21 inches long, and his head was 14 cm. A perfectly healthy baby!! He did come out with several bruses: one on his forehead, one on his cheek, one on his right arm, and one on his thigh. When we asked about them, they said that he just came out SO FAST that he got banged up in his journey. These really are the best moments in the world - the first time you meet your son/daughter. I had no clue that I looked this exhausted. I guess that's what going into labor at 1 am will do to you - haha. Getting checked out by the baby nurse. Really, everything couldn't have turned out more perfectly. I got SO MUCH of what I wanted. I went into labor on my own. My water broke on it's own. Marie was there to deliver him. He didn't get stuck. It was all perfect!